Still openings see calendar !!! Wailele Ikena (The Simpson House)... Hanalei Bay, Kauai, Hawaii. Hanalei has it all! Breathtaking views of dozens of cascading waterfalls, sheer cliff, ancient volcanic mountains covered with vegetation, and one of the most wonderful protected, uncrowded bay beaches in the world. families or couples wanting to get away from it all. There are no hotels, no condos, and no traffic lights. The Simpson House is located just off the beach in Hanalei. It is a Non-Smoking, five bedroom, three bath, well appointed, craftsman-style, family home with waterfall views from all angles. Its spacious master suite includes a soaking tub and Bamboo floors. Everything you need to experience a casual, comfortable vacation is at your fingertips or certainly no further away than within walking distance of this spotlessly-maintained Hawaiian home! There is no detail the owners have missed in providing their guests with everything needed for a perfect family vacation. We have stayed here on several occasions over the years: twice on our own and once with our daughter and her family. In each instance, the house accommodated everyone's needs. We love cooking in the fully-equipped kitchen as much as we love walking into the village of Hanalei to chose from any one of several restaurants. I think what I love about this house and the property is the spaciousness -- there's a place for everyone to feel at home. Whether it's losing oneself with a book in the upstairs loft, playing games around the great room table, or watching a movie, there's something for everyone to enjoy. Did I forget to mention the GREAT coffee at the Hanalei Bread Co. that begins our day or the short walk right around the corner to one of the world's most beautiful beaches? Just writing this makes me want to return sooner than later! 5 Stars from a finicky guest! To begin, I have to state that I am VERY particular when it comes to accommodations. It is not often that I find a place that I feel deserves 5 stars. This home DOES deserve the 5 stars. We had a family group of 11, including 3 children. Every room is furnished and decorated so comfortably. I loved how the bedrooms were divided into areas that could be semi-closed off if needed/ wanted. The owners thought of the tiniest details; from the "Mrs. Meyers" soaps in each bathroom and kitchen, to the large waste baskets in each room. There were many tour books and guides lining the bookshelf near the huge dining table. We were able to browse and plan our daily activities while enjoying our meals together. These may seem like minute details, however, to me, they make a big statement about the owners and their desire to make our stay comfortable and convenient . There were plentiful bath, beach and kitchen towels as well as extra linens. The kitchen was stocked with any pot, pan or utensil needed to cook great meals. The front porch was a great place to relax in the evenings and watch the kids play in the lush yard. There is also an outdoor shower which was so convenient to get the sand off of the kids after a day at the beach. The beach is just a few minutes walk as are the coffee shops, shave ice stands and restaurants. On Thursdays and Saturdays, the farmers market is just across the street. I can't think of a more convenient place to stay! Staying in the house made me feel right at home, in a small town, without the hustle and bustle of tour buses and condos. 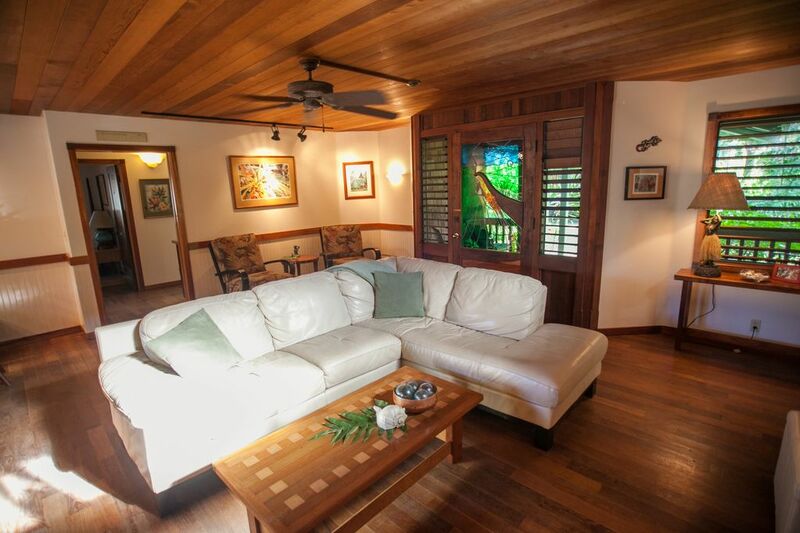 If you are thinking of going to Kauai and staying in Hanalei specifically.... DO NOT HESITATE to book this home! You will not be disappointed. Can't wait to go back again one day!!! My sisters and I stayed at this beautiful house in late October. The house was wonderful, well equipped, thoughtfully and tastefully furnished. It is a close and lovely walk to the beach, and also to town. I was very happy to to find that the house had just the right touches to lend a nice hominess to it. We were able to feel right at home. There was lots of privacy with all the bedrooms and bathrooms, and the communal areas were very comfortable and inviting.... I would love to stay there again sometime. Beautiful home, great for large families! Well stocked kitchen, linens, beach towels, beach essentials like boogie boards, chairs, umbrella, sand toys, coolers, etc. Approx 1/2 mile walk to the beach but wonderful location in down town Hanalei. Walking distance to downtown, Wai oli Hui ia Church, and a wonderful Farmers Market. Perfect location for every thing North Shore and quick access to Kilauea, Princeville, Haena. Must see: Secret Beach, Secret Lava Pools, Light house, FishMarket, Bakery, Queens Bath, Bubba's Bugers, Java Kai, Hanalei Bay, Lumahia Beach, Dry / Wet Caves, Snorkeling at Anini and Tunnels! Just an AMAZING family vacation and this is the perfect house. First time visitor - This house and area is amazing. Very convenient to enjoy so much so close. 10 days went by much too quickly. I'll just have to return. We require a 30% deposit with the balance due 90 days prior to check in. We do not offer discounts unless last minute bookings.